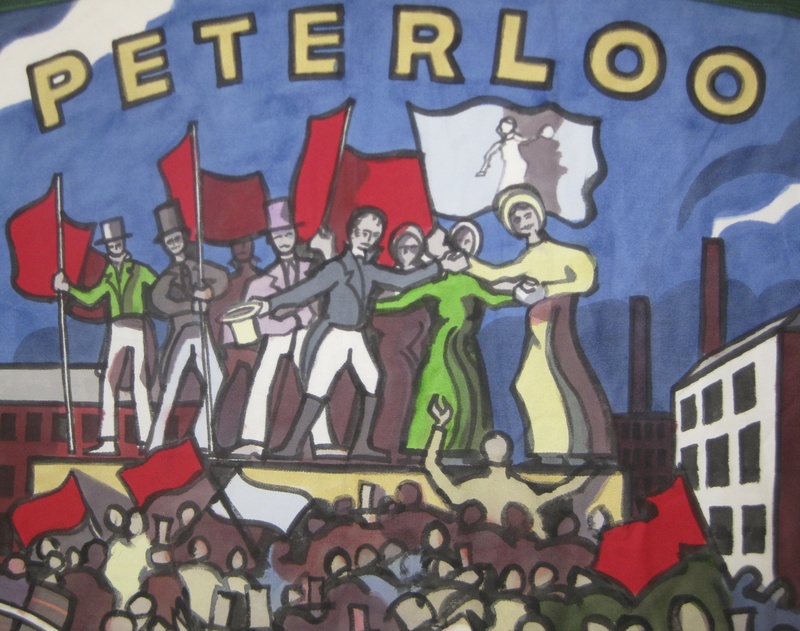 Shirin Hirsch, Researcher at People’s History Museum, discusses Mike Leigh’s new film and introduces how you can discover the legacy of the Peterloo Massacre at PHM. Mike Leigh’s film Peterloo continues to pass on this spirit. The film is a powerful cinematic intervention in bringing to life the mass organising, protest and repression of working class people in 1819. The scene of the Peterloo Massacre feels only too real as we watch the yeomanry (government forces) cut down protestors in St Peter’s Field. This is a history from below that Leigh’s film now brings vividly to our screens. In the questions and answers following the premier of the film, Mike Leigh and Maxine Peake both noted that the history of the massacre was rarely taught in schools and, even for people growing up in Manchester and Salford, the memory of Peterloo was far from widespread. The film is immersed in historical sources and literature, including research undertaken here at People’s History Museum. We hope that this film will initiate a wider discussion and interest in the history of democracy and struggle – a springboard to PHM’s 2019 programme of exhibitions, events and learning sessions, marking the bicentenary of Peterloo, exploring the past present and future of protest. 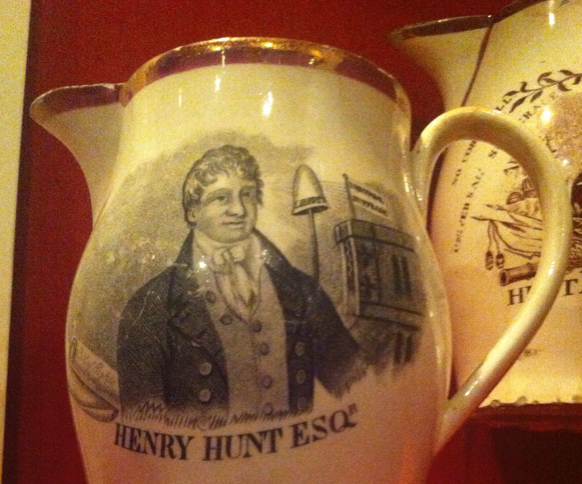 PHM’s collections tell the story of the Peterloo Massacre through visual materials and objects. On the handkerchief above, on display in Main Gallery One, you can see a snapshot of the Peterloo Massacre. The top of the handkerchief reads: ‘The Manchester Reform Meeting Dispersed by the Civil and Military Power’ and bordering the handkerchief are three demands ‘Universal Suffrage’, ‘Annual Parliament’ and ’Election by Ballot’. In the background you can see many of the buildings that surrounded St Peter’s Field, including a large cotton mill, a monument to the economic power of the rapidly growing industrial town of Manchester. Yet there was no Member of Parliament for the whole of Manchester at the turn of the 19th century. There are estimates of 60,000 people congregating in St Peter’s Field at the moment the yeomanry attack on horseback. You can see on the handkerchief many different banners held, often with the cap of liberty on the top of the stick, a symbol of the French revolution. ‘Unite and be Free’ and ‘Taxation without representation is unjust and tyrannical’ are just some of the slogans shown. The ‘hustings’, where the speakers stood on a platform are also depicted, with Henry Hunt as the main orator, alongside speakers including Mary Fildes, the President of the Manchester Female Reform Society. On the handkerchief you can see one of the banners is inscribed with the words ‘Royton Female Union Society’, showing the large and organised section of women protestors emerging within the reform movement. Despite the chaos shown in the picture, this was not an accidental massacre. In the film we watch the discussions as the local magistrates give the order to disperse the crowds, and in the build up to the protest the yeomanry are seen sharpening their sabres (swords with a curved blade). Two of these sabres are on display in Main Gallery One, passed down through generations and kept under a bed in Droylsden before being donated to the museum. There are wide ranging estimates of how many were killed at Peterloo. It is hard to be exact with these statistics as there are huge debates as to who should be counted. Do we only count people who died on the day? Or people who died days, months or even years after, from lasting injuries? It is also highly likely that some of those killed are not on the surviving casualty lists, which were compiled not long after the massacre. Historian Michael Bush has carried out analysis of the casualty lists and estimates that 18 were killed at Peterloo, and other historians estimate around 700 were injured. The handkerchief we have on display was just one way of keeping alive the memory of Peterloo. The British government was keen to cover up the massacre, imprisoning the reform leaders and clamping down on those who spoke out against the government. Many of the commemorative Peterloo objects on display in Main Gallery One were created to break through this repression as material ways of refusing to forget. To mark the bicentenary of Peterloo, PHM will continue this memory, not simply as a history lesson, but reflecting on protest and dissent from 1819 until the present day, and looking to protest of the future. Why not visit People’s History Museum and our Archive & Study Centre to continue the debate on the Peterloo Massacre and its impact today. 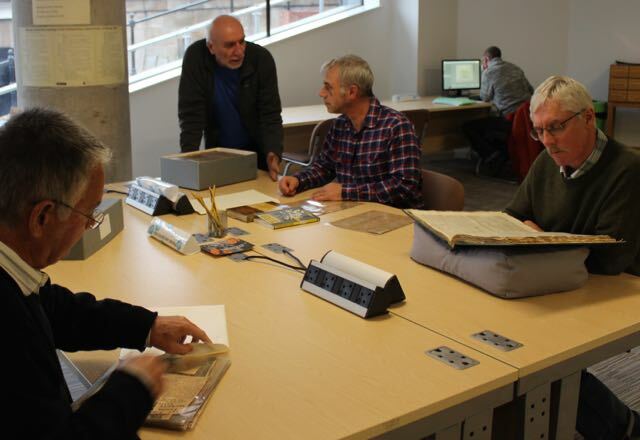 In our archive we hold newspapers from across the world reporting on the Peterloo Massacre. This pamphlet has recently been republished by Bookmarks publishers – an accessible and exciting way into this history. A real classic on the massacre, recently republished by Ebury Press. A new book based almost entirely on eyewitness reports and contemporary documents. Riding was the historical advisor for the Peterloo film and this is a new book analysing the massacre. Shirin Hirsch is a historian based jointly at People’s History Museum and Manchester Metropolitan University. PHM has been working with Scope to collect campaigning material relating to the campaign for the Disability Discrimination Act. Here their Campaign Officer, Tom Hayes, writes about the success of the project so far. Nelson Mandela is known the world over for his impressive fight against racial segregation in South Africa. Helped by a recent blockbuster film, Britain’s women’s suffrage movement is better known among people today. Whether projected onto big screens or taught in classrooms, similar civil rights fights from Selma to Stonewall are well-known. Other equality campaigns have been wholly forgotten, however. Twenty years ago this month, Parliament finally passed a law to ban discrimination against disabled people. This change would never have happened without the fierce campaigning of disabled people. In their thousands, disabled people gridlocked cities up and down the country, throwing themselves from their wheelchairs and chaining themselves to buses. Their message was clear: activists wanted rights. Not tomorrow or in a year, but, as their campaign’s name demonstrated: Rights Now! For the first time, disabled people joined together, discovered they were not isolated and alone, and decisively smashed society’s flawed view of disability as something requiring pity not rights. The law passed twenty years ago – the Disability Discrimination Act – fell short of the civil rights Act that so many disabled people campaigned for. But the campaign itself was life-changing for so many and challenged society’s stereotypes and negative attitudes. Many of the leading disabled campaigners drew inspiration from the fights against Apartheid and for the vote for women. The suffragette Sylvia Pankhurst is the only person that one of today’s leading disabled campaigners and a civil rights veteran, Baroness Jane Campbell, says she would be if she could travel back in time. Many Rights Now! members moved into disability rights campaigning from the anti-Apartheid movement because they despised the injustice of segregation wherever they saw it. However, in sharp distinction to the equality campaigners who inspired them, Baroness Campbell and others have a hidden history of campaigning. The campaign which took so much of the media spotlight in 1994 and 1995 has been entirely forgotten today. Young disabled people – even those who campaign for change in their communities today –have been shocked to find their rights have not always been there and needed a fight to bring about. That’s why Scope has been celebrating the civil rights activists who fought for equality and brought about the change that happened twenty years ago this month. We’re proud to be working closely with the People’s History Museum to preserve a past in danger of disappearing. Together we have appealed to campaigners to rummage through their attics and find mementoes. In the next few weeks, we’ll be sharing some of the treasures that leading campaigners have shared with us as a direct result of our joint public appeal for donations. Until that time we will be sharing some stories of the civil rights campaign, as told by the leading activists themselves. The campaigns which inspired disabled activists twenty years ago are honoured every day by the People’s History Museum in the galleries that are seen annually by tens of thousands of visitors. Together we want as many people to see disabled people’s campaigning, right alongside better-known movements, so that their campaigning can inspire today’s activists as much as others do. 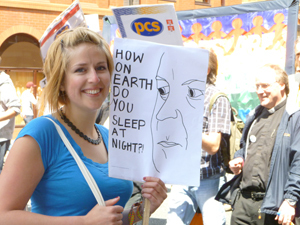 Disabled people’s campaigning has been central to our national march towards equality. Scope can have no better partner to honour this campaign than the People’s History Museum – the nation’s own museum of democracy and equality. Work experience student Sylvie Copley has analysed the first wave of responses to questions asked in our current changing exhibition Election! Britain Votes. Election! Britain Votes opened on Saturday. 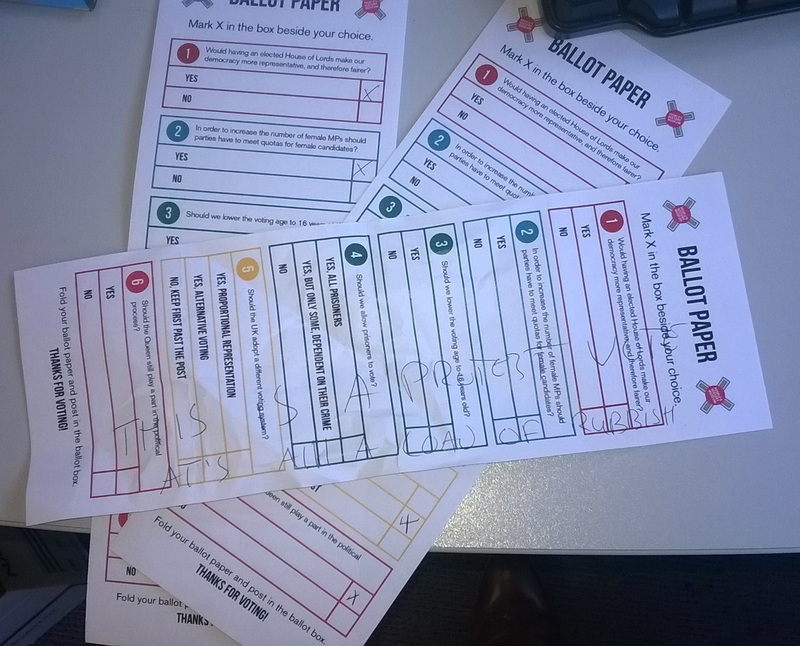 As well finding out more about how elections work, visitors can share their opinion on our electoral system. We’ve already had 116 responses to our ballot paper questions. Would having an elected House of Lords make our democracy more representative, and therefore fairer? – 84% Yes and 16% No. In order to increase the number of female MPs should parties have to meet quotas for female candidates? – 52% Yes and 48% No. Should we lower the voting age to 16 years old? – 48% Yes and 52% No. Should we allow prisoners to vote? – 32% Yes, 30% Yes, but only some, dependent on their crime and 38% No. Should the UK adopt a different voting system? – 50% Yes, proportional representation, 23% Yes, alternative voting and 27% No, keep first past the post. Should the queen still play a part in the political process? – 39% Yes and 61% No. Others gave responses for their votes. ‘It’s patronising’ one respondent said, ‘to suggest women can only win if male competition is removed.’ Although as shown above, the rest of the voters did not see this as clear cut. The most surprising response was the majority vote opting for proportional representation instead of our current system – even though in 2010 when a referendum was held, the nation declined the change. Come and have your say. Election! Britain Votes is on display until the 28 June 2015. It’s here. The election campaign has arrived proper. Arriving at my desk this morning following the festive fun, all prepared to begin the finishing touches on our next exhibition – Election! Britain Votes – the political parties have this weekend launched their campaigns. And the parties’ weapon of choice to begin the battle is the poster, an object central to electioneering in the twentieth and twenty first centuries. Despite the poster’s venerable traditions commentators have been pretty scathing of the two most recent examples. The Independent’s Zachary Davies Boren thought the Tory’s ‘Let’s stay on the road to a stronger economy’, ‘about as poor a start to a general election campaign as you can get’. Labour’s ‘The Tories want to cut spending on public service back to the levels of the 1930s, when there was no NHS’ which used a five year old image of David Cameron ‘not much better’. The road on the Conservative example is apparently German, generating significant complaints, one wonders who really cares. The trope of drawing the eye to a brighter future somewhere over the horizon is pretty common in the election imagery of both left and right. More usually a rising sun is involved. Useful are suns in campaigning, the recognisable image of a new dawn. A 1929 Labour example on our galleries shows a family staring towards the horizon and a brighter future. From my point of view it’s not that the road pictured is German, or that Labour used an image from 5 years ago. It’s that the slogans of both are so long and so clunky. Even in 1970 people who devised slogans had to justify if they moved beyond a few words. Here in the archives at PHM we have material relating to the production of Labour posters from the 1970 General Election. Then Labour’s advertising devised the slogan ‘Now Britain’s strong let’s make it great to live in’ When it comes down to it aren’t Labour’s ideals yours as well? The advertising executives stated that the party should not be afraid of long slogans. After all, they were ‘asking people to think about things’. People need to think but surely they also need to remember? The Conservatives 1979 ‘Labour isn’t working’ or Labour’s ‘Because Britain Deserves Better’ from 1997 live longer in the memory than the current efforts. However, my view doesn’t really matter. When Election! opens on the 14 February there will be a section of the gallery dedicated to the 2015 campaign. Ever changing, it will reflect what the parties say and what the visitor thinks. Before that we’ve put up ‘Let’s stay on the road to a stronger economy’ in the museum to see what people think – it’s a PHM focus group. And we’ll report back any thought- provoking comments. Election! Britain Votes opens on the 14 February 2015. Do you have an idea worth fighting for? Do you want to spread the word creatively? Claire Curtin is here to help! Claire’s residency runs from Saturday 9 August – Friday 15 August. Throughout the week you can pop into her studio and help her to create protest artworks, including placards, badges and letters. Claire will be holding two screenprinting workshops on Saturday 9 August and Thursday 14 August, 1.00pm – 3.00pm. Pop along for free family friendly fun! The residency will culminate in a procession on Friday 15 August. Bring a placard and meet at the PHM at 5.00pm. We’ll march down to Lincoln Square at 5.15pm, where we’ll gather for our Democratic Demonstration, with speeches and music. Grab the megaphone and promote your idea worth fighting for! Everyone’s welcome, and please let us know that you’re coming by emailing catherine.odonnell@phm.org.uk or call 0161 838 9190. It goes without saying that we won’t promote any ideas that are in any way offensive (eg racist, sexist, homophobic, etc). Please note that Claire will be out of the studio on 10 & 11 August, but there’ll still be lots to do!